It's rare that researchers and others turn to popular press for an update about a particular topic. Nonetheless, an essay by Erica Goode in the New York Times called "Learning From Animal Friendships," provides a nice summary of what we know -- actually the little we know -- about cross-species friendships in nonhuman animals (animals). For years some researchers actually debated whether or not animals "made friends," even among members of the same species. They would put the taboo "F" word, friends, in quotation marks, to reflect their uncertainty. Thus, the use of "friends" would mean two dogs or two cats who we would call buddies or BFF's were merely acting as if they were friends, but we really don't know if this is so. Surely, anyone who's lived with more than one dog or cat or rat, for example, or who's done long-term field work on social animals, know they form deep and meaningful friendships. I have always found this uncertainty to be simply absurd, even when applying the most rigorous criteria to the concept of "friend." In the New York Times essay, Dr. Barbara King notes that a friendly relationship "must be sustained for some period of time; there must be mutuality, with both of the animals engaged in the interaction; and some sort of accommodation must take place in the service of the relationship, whether a modification in behavior or in communication." These are excellent guidelines for assessing the nature of a relationship between two or more individuals. Applying these criteria, animals clearly form friendships with members of the same species, and now we see the same is true for members of different species, often called odd couples. 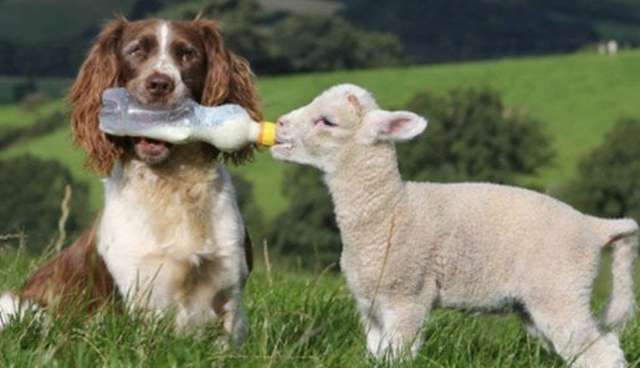 Ms. Goode provides many different examples of cross-species relationship -- friendships -- and I highly recommend her essay as she presents the different sides of the debate about the nature of odd couples. Dr. Barbara Smuts, a primate researcher who works at the University of Michigan and who brazenly and openly used the word friends way back in the mid-1980s notes, "We know this is happening between all sorts of species. I think eventually the scientific community will catch up." I couldn't agree more. Let's get over thinking that we're the only species in which friendships form, and learn more about the other fascinating animals with whom we share our magnificent planet. Kudos to Ms. Goode for providing an excellent summary of what we know about odd couples. I highly recommend her essay for a quick update on this topic. I hope more research will be done in this area.